When you think luxury, you don’t exactly think affordability, do you? A sporty car with a lavish design and plush interior is something most of us dream of, but would never run out and buy, not without at least doing some heavy research. In that case, let’s begin that research process here, right now, with the 2017 Nissan Maxima in Downers Grove, IL. This is the Nissan Maxima like you’ve never seen it before. Redesigned for 2016, the 2017 Nissan Maxima is a full size sedan and the most luxurious and powerful within the Nissan brand. 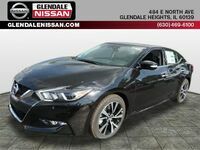 Its MSRP begins around the $30,000 mark while there are six trim levels to choose from, each one better connecting you to your car through technology features and comfy creature comforts you never knew you’d be able to afford on your next car. Intrigued? We’d love to tell you more! All six trim levels of the 2017 Nissan Maxima are powered by a 300-horsepower 3.5L V6 engine. Even with a heart-pounding amount of power, the Maxima still is able to earn a more-than-reasonable fuel economy rating of 21 city/ 30 hwy mpg. Go on, enjoy your drive to work! Depending on your mood, pick your driving mode in the Nissan Maxima. The Drive Mode Selector allows you to alter throttle response by switching from Normal Mode to Sport Mode. The throttle response will be made quicker while steering is made heavier and shifting is quicker. From head to toe, exquisite detail is paid to the Nissan Maxima. A number of wheel and tire combinations are available , but the 18-inch aluminum alloy wheels are aggressively styled and are exclusive to the Maxima. As for the Maxima SR, it bumps up to 19-inch aluminium-alloy wheels. When redesigning a sports sedan, it’s not a bad idea to take a few pages from the brand’s ultimate supercar, the one-and-only, Nissan GT-R. Take for example the center console within the Maxima, it has been tilted 7-degrees towards the driver, just like in the cockpit of the GT-R, placing each button, knob, and dial perfectly within reach of your fingertips. There also are the sport-styled front seats crafted with Nissan’s zero gravity design which can be heated and cooled to your comfort desire. These seats are able to conform to your body and keep it snug and secure when taking off and cornering. Other driver-centric ingenuities in the 2017 Nissan Maxima include the Nissan Advanced Drive-Assist Display which is a 7-inch screen located behind the steering wheel. Here pertinent information is available at a glance without being distracting. You’ll be able to check the time, temperature, number of miles left in the gas tank, receive turn-by-turn directions and even see who is calling through caller ID. In addition to this screen, there is the standard 8-inch multi-touch control screen. This system allows drivers and passengers to sync their iPhone through Apple Carplay and access a number of apps, music, audio books, maps, and phone contacts so that you can place/answer calls or compose/read text messages. Drivers interested in learning more about performance and design or all of the safety systems the 2017 Nissan Maxima is equipped with are encouraged to contact a Glendale Nissan team member or stop by for a test drive. We’d love to show you all that the Maxima can do!